11th February - Sail from Portsmouth for Shakedown period and to prepare for BOST. 25th February - Staff Sea Check. Basic Operational Sea Training (BOST) commences at Devonport. 21st March - BOST complete. 22nd March - Portsmouth for maintenance period and Easter leave. 15th April - Sail from Portsmouth for Aviation Work Up. 7th - 9th May - Operational Readiness Inspection. 16th May - Sail for Mediterranean deployment. 25th - 28th May - Visit to Alicante, Spain. 28th May - Sail for Exercise DYNAMIC MIX. 9th - 14th June - Visit to Palma, Majorca. 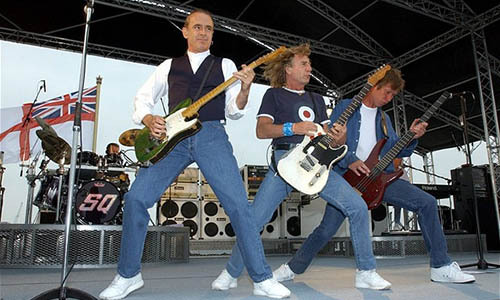 19th June - Visit by Status Quo to record the video for their single "Jam Side Down". 20th June - Families Day, at sea. 27th June - Visit by Her Majesty The Queen and the Duke of Edinburgh as part of the Golden Jubilee Celebrations. July - Captain Alan Massey joins as Commanding Officer. 30th July - Status Quo concert on the flight deck to launch their "Heavy Traffic" album. August - Portsmouth for maintenance and Summer leave. 2nd September - Sail from Portsmouth for Exercise ARGONAUT 02. 19th - 23rd September - Visit to Gibraltar. 26th September - Arrive in Valletta, Malta to participate in celebrations marking the 60th anniversary of the Malta Convoys. 1st October - Sail from Malta. 5th - 8th October - Visit to Naples, Italy. 12th October - "Ark Royal's Blind Date" show (sods opera) in the hangar. 28th October - Arrive in Barcelona, Spain. 2nd November - Sail from Barcelona. 8th November - Portsmouth for Base Assisted Maintenance Period and leave. December - Portsmouth for maintenance and Christmas leave.